This 14th century lively history introduces basic Buddhism as practiced throughout India and Tibet and describes the process of entering the Buddhist path through study and reflection. In the first chapter, we read about the structure of Buddhist education and the range of its subjects, and we're treated to a rousing litany of the merits of such instruction. In the second chapter, Butön introduces us to the buddhas of our world and eon, three of whom have already lived, taught, and passed into transcendence, before examining in detail the fourth, our own Buddha Shakyamuni. 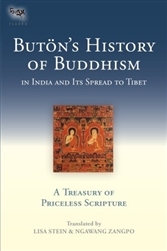 Butön tells the story of Shakyamuni in his past lives, then presents the path the Buddha followed (the same that all historical buddhas, including future ones, must follow). Only at the conclusion of the discussion of the result—enlightenment—do we return to the specific case of the Buddha and his twelve deeds. This marks the start of the history of the Buddha as most of us imagine it. 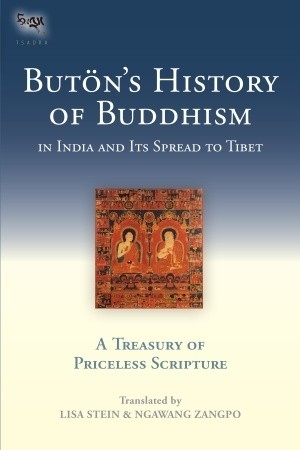 After the Buddha's story, Butön recounts three compilations of Buddhist scriptures, and then quotes from sacred texts that foretell the lives and contributions of great Indian Buddhist masters, which he then relates. The chapter concludes with the tale of the Buddhist doctrine's eventual demise and disappearance, a concept and a tale squarely within the Mahayana. The final chapter, the shortest of the three, gives an account of the inception and spread of Buddhism in Tibet, focused mainly on the country's kings and early adopters of the foreign faith. The watershed debate at Samyé Monastery between representatives of Chinese and Indian styles of Buddhist practice is given the most attention in this chapter. An afterword by Ngawang Zangpo, one of the translators, discusses and contextualizes Butön's exemplary life, his turbulent times, and his prolific works.